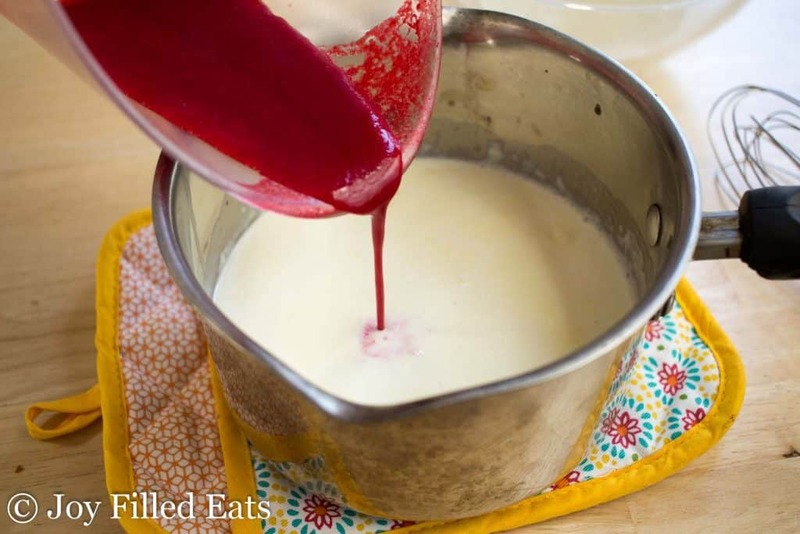 Panna cotta used to be the dessert I would order anytime I saw it on a restaurant menu. I prefer it’s cool creaminess to creme brulee (I don’t love that burned sugar crust), cakes, ice creams, and almost all the rest. I don’t remember the first time I tried it but I think it was when I was in college and my best friend and I went to the ChikaLicious Dessert Bar in New York City. It was a splurge, $15 just for dessert, but it came in three courses and I couldn’t resist trying it. A dessert app, dessert main dish, and dessert dessert? I was there. And it was amazing. 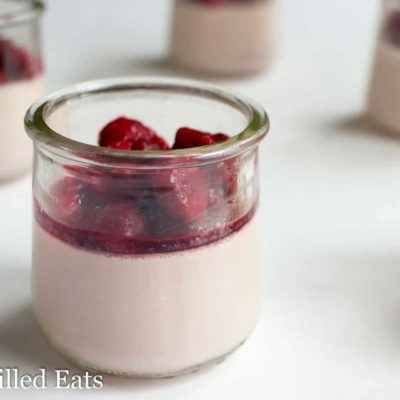 My Raspberry Panna Cotta is inspired by this recipe by David Leibovitz which was the first panna cotta I ever made at home. Adding in the raspberry puree. And mixing to get that beautiful pink color. That’s it. 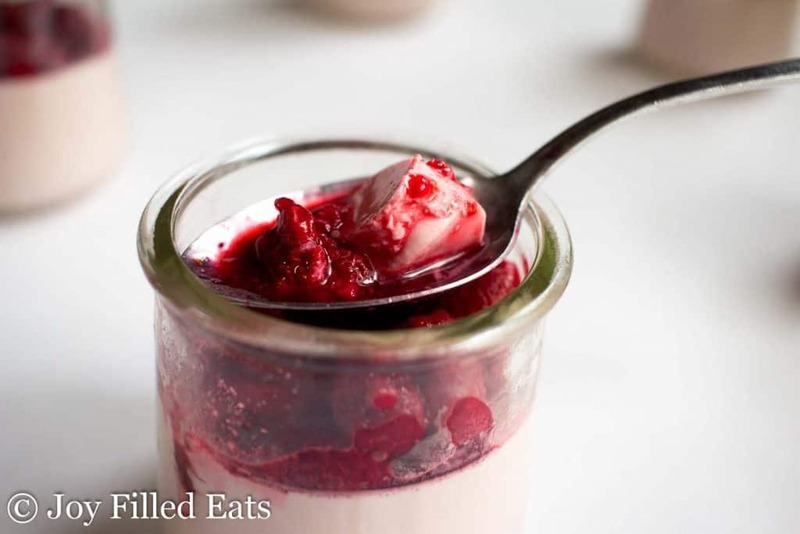 That is what makes my Raspberry Panna Cotta Recipe Easy. 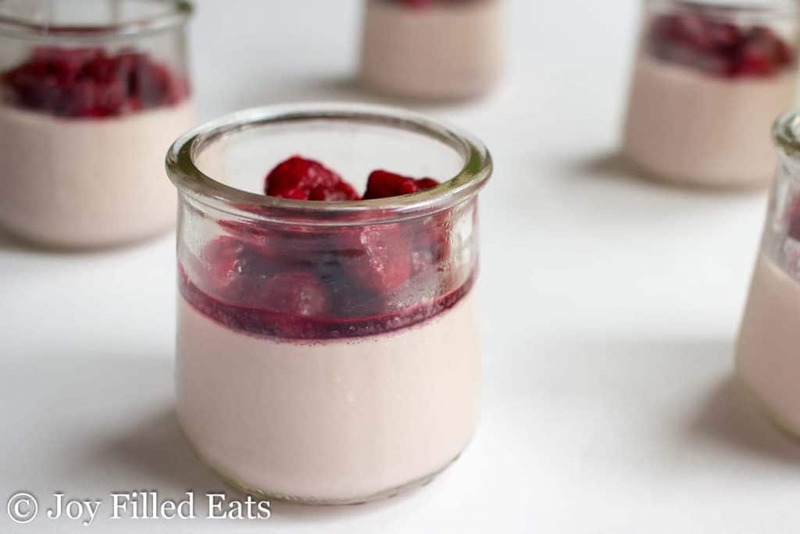 My Raspberry Panna Cotta is perfect for Valentine’s Day or any other time of year. 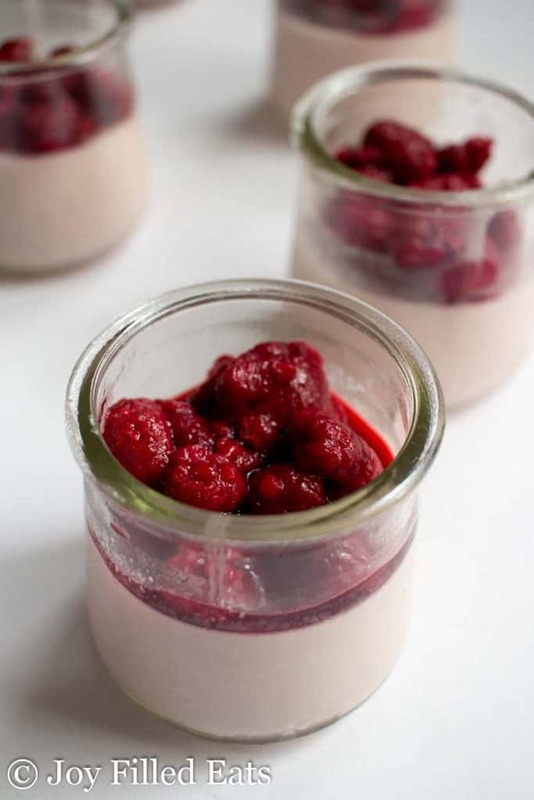 Panna Cotta. 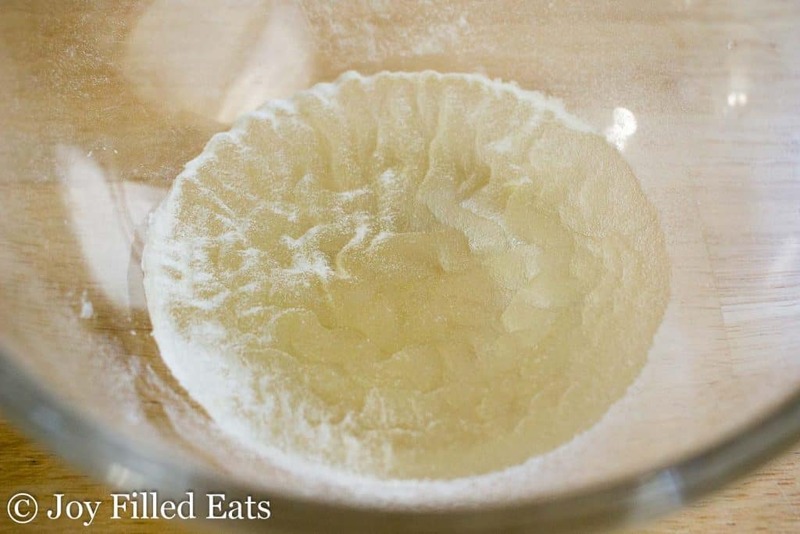 It sounds fancy and it tastes delicious but you'll never realize how simple it is to make. Only 5 ingredients in a restaurant quality dessert. It is basically a gelatin made with heavy cream. 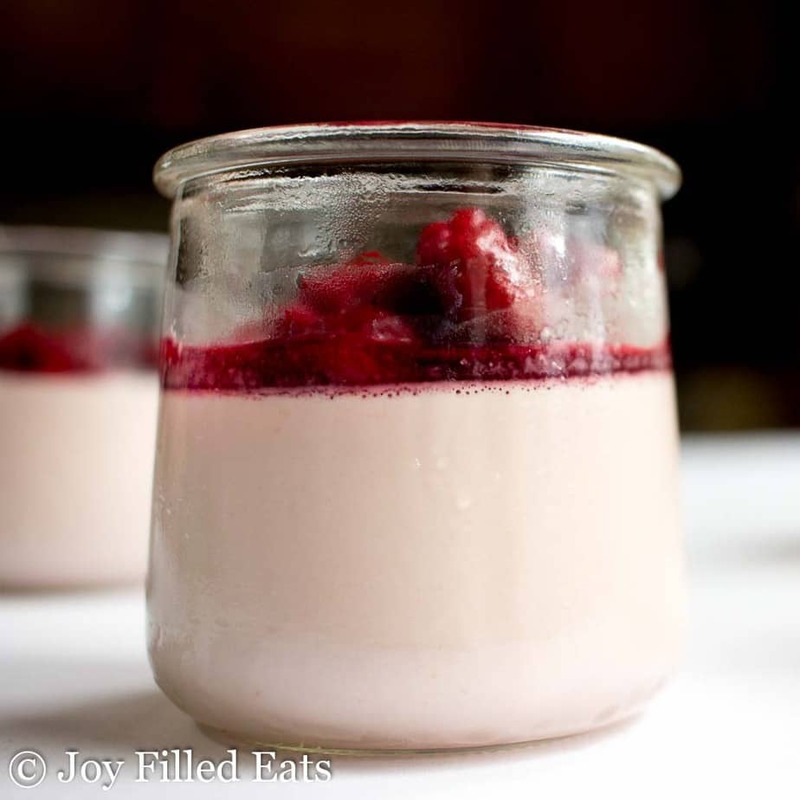 If you can make a box of jello you can make my Raspberry Panna Cotta. Put the cold water in a medium bowl. Sprinkle with the gelatin. Let stand 5 to 10 minutes. Heat 1 cup of the raspberries until warm (do not discard the juice) and strain through a fine mesh strainer. Discard the pulp and seeds. 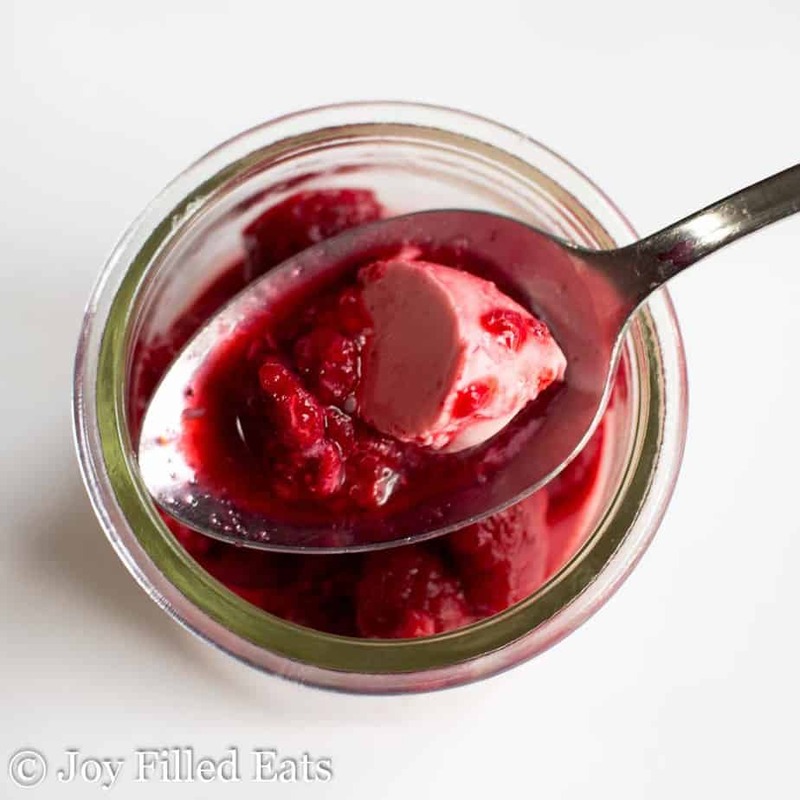 Set the raspberry puree aside. Put the remaining raspberries in the fridge for later. Heat the cream and sweetener until the sweetener is dissolved. Remove from the heat. 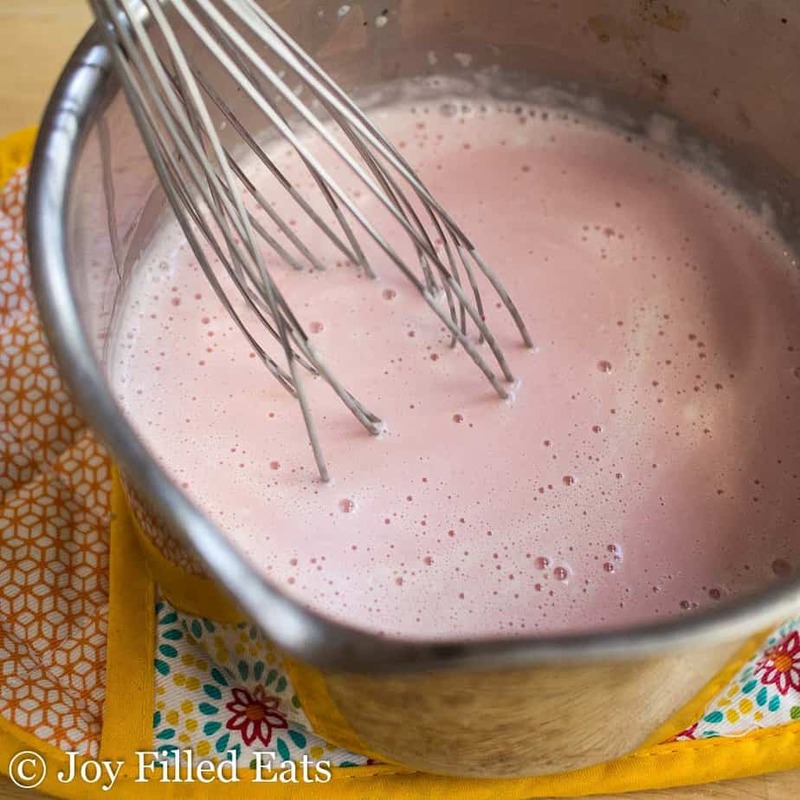 Whisk in the raspberry puree. Whisk vigorously whisking slowly pour the cream mixture over the gelatin. Stir until the gelatin dissolved. Divide between 6 small glass jars or ramekins. Refrigerate for 2 to 4 hours. Add the remaining 1 tablespoon sweetener to the raspberries. Divide between the now firm panna cottas. Store in the refrigerator. 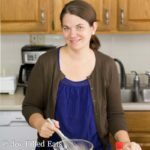 Do I need fresh raspberries or can I use frozen that have been thawed? I'm sorry, this recipe needs gelatin. It won't thicken without it.